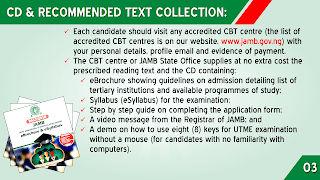 The Joint Admission Matriculation Board, JAMB has published the Top 5 Necessary Application Instructions for all candidates seeking to purchase the 2018/2019 JAMB UTME and Direct Entry Form. The Top 5 Application Instructions are been illustrated with images for better and easier understanding for all students. Each candidate must have a personal email address and mobile phone number. Each candidate is to use his/her functional and valid personal email address. The system would reject at the point of registration any already used e-mail address. 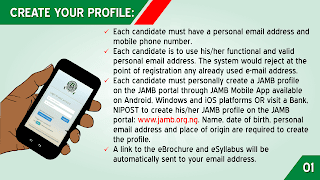 Each candidate must personally create a JAMB profile on the JAMB portal through JAMB Mobile App available on Android, Windows and iOS platforms OR visit a Bank, NIPOST to create his/her JAMB profile on the JAMB portal: www.jamb.org.ng OR Using Unique Mobile Number. Name, date of birth, personal email address and place of origin are required to create the profile. A link to the eBrochure and eSyllabus will be automatically sent to your email address. Payment for JAMB's registration ePIN and the recommended reading text is done at the banks and NIPOST. 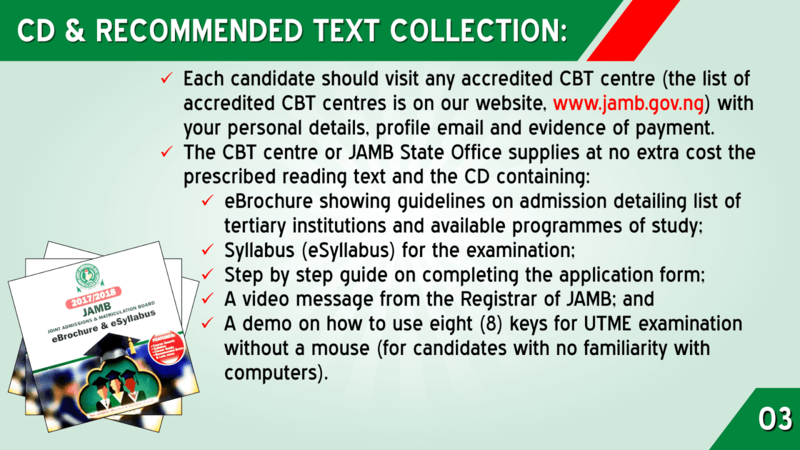 Banks have also agreed to make these services available at CBT centres and JAMB State Offices. Registration fee for the 2019 UTME or Direct Entry is Three Thousand Five Hundred Naira (N3,500.00) only. You are also to pay Five Hundred Naira (N500) only to obtain the reading text, "Sweet Sixteen by Bolaji Abdullahi" for UTME candidates and "The Last Days at Forcados High School" for Direct Entry Candidates. Candidates should note that ePINs being purchased are tied to individual profiles and are not transferable. Candidates are advised to keep as confidential their security details such as registration numbers, password/numbers of ATM Cards, email addresses and ePINs. Each candidate should visit any accredited CBT centre (the list of accredited CBT centres is on our website) with your personal details, profile email and evidence of payment. A demo on how to use eight (8) keys for UTME examination without a mouse (for candidates with no familiarity with computers). Each Candidate is to complete the online application form by supplying the required details such as name, email address, L.G.A., academic qualifications, etc. At the CBT centre, Candidate's ten fingers biometric and image will be captured and uploaded. O/L and/or A/L grades are to be provided by candidates. Candidates who are awaiting result should supply the result online as soon as the results are available. 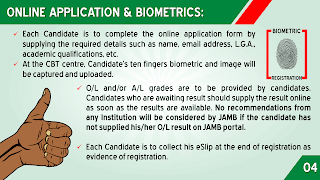 No recommendations from any Institution will be considered by JAMB if the candidate has not supplied his/her O/L result on JAMB portal. Each Candidate is to collect his eSlip at the end of registration as evidence of registration. There will be no offline registration as all the accredited CBT centres have been empowered for real time online registration. 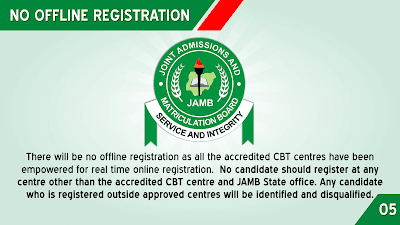 No candidate should register at any centre other than the accredited CBT centre and JAMB State office. Any candidate who is registered outside approved centres will be identified and disqualified. You MUST indicate that you are visually impaired (BLIND) when you register for the examination. 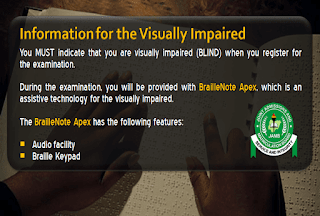 During the examination, you will be provided with BrailleNote Apex, which is an assistive technology for the visually impaired.